Michael Jacobs traveled to Bangalore, India, in the summer of 2012 to participate in a study-abroad program through the Eller College of Management at The University of Arizona. As part of his program, he attended networking events and toured local businesses. A senior in business management, Jacobs hoped to maintain the relationships he formed, but when attempting to connect online with the people he had met, he encountered a problem. "I couldn't spell their names, and that made it impossible to find them on social networks," he recalls. 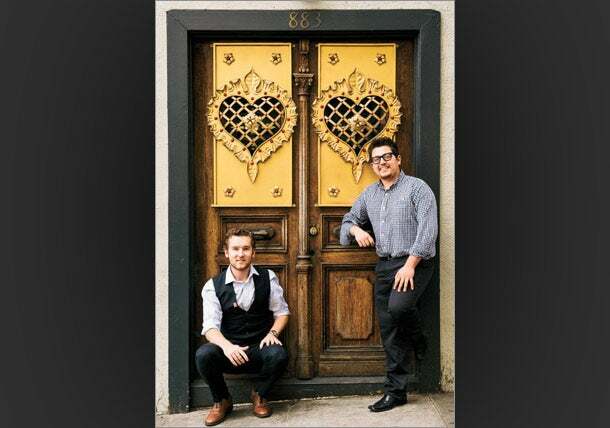 Relationship experts: SociaLink's Michael Jacobs (left) and Hector Rosales. Jacobs expressed his frustration to another student in his program, finance and economics major Hector Rosales. The pair came up with the idea for SociaLink, an app that uses Bluetooth for instant, in-person connections on multiple social networks simultaneously. Users connect SociaLink to their accounts on Facebook, Twitter, LinkedIn, Instagram and Tumblr. Making connections with another SociaLink user requires hitting the"connect" button and waiting for the other user to accept, linking multiple social networks with that one invitation. Even though they had the idea, Jacobs and Rosales needed help developing their app. "We decided to use the resources around us to our advantage," Jacobs says. With three weeks to go on their program, the pair interviewed 15 app developers in Bangalore and hired one, paying the $5,000 fee with funds raised through their families. Leading up to the release of the free iPhone app in January, Jacobs and Rosales worked frantically to spread the word about SociaLink. Within two months of its release, the app hit 2,000 downloads. While working toward their target of 100,000 downloads, the partners are exploring several revenue models, including accepting ads and offering a premium version of the app. "Michael and Hector have been quick to embrace the notion that it's not just about a cool idea as much as having the ability to focus on doing the work to make it viable," explains Jane E. Robbins, senior lecturer with the McGuire Center for Entrepreneurship at the University of Arizona. Since launching SociaLink, the team has added a new function that allows users to connect via e-mail with those who don't have the app. Jacobs and Rosales are hoping to raise $10,000 to upgrade the app, introduce an Android version and increase their marketing efforts. "It has changed the way we're networking, and we want to spread that message to the world," Rosales says. "We're letting our passion guide us to push the product out and make it the best networking resource available."